Doctor Who: THE MYSTERIOUS PLANET Audiobook Review | Warped Factor - Words in the Key of Geek. You’ve got to love Terrance Dicks. It’s the law. Besides which, it’s an adoration much deserved: ‘Cuddly Uncle Terrance’ as he’s now thought of by much of fandom has long been part of the lifeblood of Doctor Who, not only in his role as writer and Script Editor on the show, but as by far the most prolific noveliser of Who stories for the Target range. Before Netflix and chill, before streaming and torrenting, before DVDs and VHS, Uncle Terrance was for many years the best hope many Who fans had of ‘experiencing’ a whole swathe of Doctor Who stories, the Target range bringing sections of the programme’s history to life in a way that was usually pretty damned faithful to the original, tweaking only some of the least successful details and giving, where necessary, a little additional richness and insight into characters’ lives and the workings of the worlds on which the adventures took place. You don’t technically have to love Lynda Bellingham, though it might be considered rather churlish not to. Britain’s favourite Mum throughout the eighties, she swapped her gravy boat for the headdress of a Time Lord Inquisitor for the whole of the Trial of a Time Lord season, and then reprised the role in far greater depth at Big Finish, through the Gallifrey audios and in the flip-sided story, Trial of the Valeyard. When it came to finding a voice for the audiobook reading of The Mysterious Planet, the first sub-story in the Trial season, Bellingham was a natural choice – who better to set up proceedings than the queen of the courtroom? The great thing about the audiobook version is that Terrance Dicks delivers a rendition of The Mysterious Planet that’s for the most part word perfect, so you get the sense of atmosphere and joie de vivre of Robert Holmes’ last full script for the show, but it’s also given a little of Uncle Terrance’s magic – the opening sequence of the space station is expanded, and Dicks goes to town a little putting it into context of the surrounding space, giving the station itself a sense of colour and hugeness even beyond what was conveyed by the exceptional modelwork of the original. That sense of word perfection contrasts sharply with some other novelisations, even – or particularly – Robert Holmes’ own novel of The Two Doctors, where dialogue was apparently remembered to a degree that was ‘close enough’ for the author, but which often made the listener feel like they were listening to a pirate copy of the story, re-worded and re-shot by someone other than the original author. Dicks hardly ever messes about like that – he knows what Doctor Who fans want, and he’s the greatest still-living adept at delivering it to them, meaning The Mysterious Planet feels fresh and realistic. If there are, in the later sections, an excessive number of descriptive adverbs – people looking up ‘worriedly’ or commanding their warriors…erm…commandingly, they only occasionally interfere with the flow, and a skilful narrator can propel the story onward without letting them become too much of a pain to the listener. Lynda Bellingham, for her part, is a skilful narrator, and also an enormous relief – her Inquisitor on-screen was rather arch and prim, partly in service to the inflated dignity of the character, and partly we suspect to differentiate her from ‘that woman who plays the Oxo mum’ for a nation of geeks who knew her chiefly through her work as the anchor of a series of beloved commercials. Reading The Mysterious Planet significantly later in life, and having established herself in a lot more sitcoms and comedy-dramas, as well as with her natural voice as a presenter, Bellingham is a nimble narrator, giving at least a sense of most of the original character-voices, including a more-than-passable Peri and a Glitz that maintains the rogueish psychopathy of the original, even if her Merdeen’s a little more squeaky than Tom Chadbon’s original, and her Balazar a little more thuggish than Adam Blackwood’s ‘pallid little swot.’ Without meaning any unkindness to the memory of Joan Sims, it’s also a delight to have a Queen Katryca who sounds far more like she understands the life she leads, and who leads it when we’re not looking at her as well as when the camera swings around. Even Bellingham’s own original character, the Inquisitor, appears to have unlaced her corset rather, and to be a mellower individual, for all she still delivers the snap and zing of an affronted ego from time to time. Significantly, and against all the laws of logic, Bellingham also slows down the dialogue quite a bit, but the joyful result of that, and of having a single narrator for both the Ravolox and trial sections, is that there feels like much less of a jarring in the tone between them, perversely allowing the energy of the Ravolox action to be banked and maintained while the ‘empty banter’ of the trial sections does what it needs to do. Bellingham carries the energy across, so if anything, the combination of Terrance Dicks’ faithful recreation of the original with a little extra buttery richness where needed and Bellingham’s slower but consistent delivery makes the audiobook version more enjoyable in some ways than the televised version. Of course, you lose out on Michael Jayston, and there’s no-one alive who can replace his voice, making Bellingham’s Valeyard a little more obviously like a school swot, a shiny-skullcapped bringer of apples for teacher than Jayston’s burnt cork and crushed velvet voice made him appear, but again, there’s an upside to that – without Jayston there to relish every word, to drip venom and malice and sneer into things, it rather speeds up the trial sections, allowing Bellingham’s Sixth Doctor to have his tantrums and explosions and get on with business – though Dicks makes the Sixth Doctor’s outbursts rather more calculated sometimes than they appeared on screen, giving tiny Easter Eggs of psychology that there simply weren’t time or convenient ways to deliver in the space of four twenty-five minute episodes. 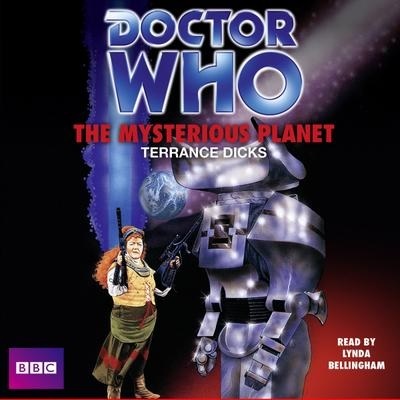 Bottom line – if you’re mourning the loss of your youth, wondering what Doctor Who was like in Ye Olde Nineteen Eighties, or simply getting your 1986 on as we celebrate the geekiness of thirty years ago, you could do worse than picking up the audiobook of The Mysterious Planet. It’s not very much different from the original TV version, and if you lose some of the breakneck pace of the last couple of episodes of running about, you do at least gain far more tonal consistency in Bellingham’s narration than you get from the stop and start intrusiveness of the real thing. Pick it up, and let the Inquisitor take you back thirty years this week.